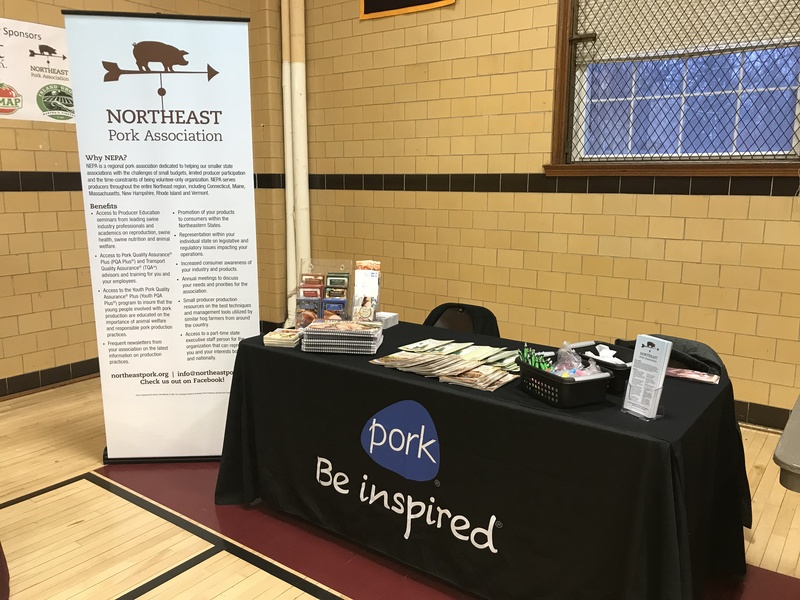 On January 28, 2018, The Northeast Pork Association (NEPA) was one of the primary sponsors for the Southern New England Livestock Conference hosted by The Livestock Institute of Southern New England (TLI) at Bristol County Agricultural High School in Dighton, MA. As a sponsor, we had a table at the event and had the chance to meet with almost 200 farmers, agriculture teacher, students, and others with an interest in livestock production from across the region. It was a great event with workshops all day long on topics such as pasture raising pigs, marketing, and health benefits of meat. TLI is a Massachusetts based non-profit organization comprised of farmers and local food advocates dedicated to addressing concerns facing livestock farmers in Southern New England. They host seminars and workshops on raising livestock, humane handling, and marketing of meat products. They’ve been working hard and in June of 2018, they will be opening a state-of-the-art facility offering slaughtering, cutting and vacuum seal packaging, and value-added products. They are starting to book for the summer and fall, so reach out to them today to use New England’s newest slaughter facility! The facility will be called Meatworks and is located in Westport, MA. Contact Amado Baeza at 774-319-5616 or amado@thelivestockinstitute.org. ← Swine Health Workshops A Success!